This display shows areas of reduced surface water during during times of drought and low tide. See the Flood Display for areas of expanded surface water during floods. Blue is the extent of current surface water as imaged during the time interval shown by the two MODIS sensors aboard Terra and Aqua. Water areas are accumulated over 10+ days to remove obscuration by cloud cover. 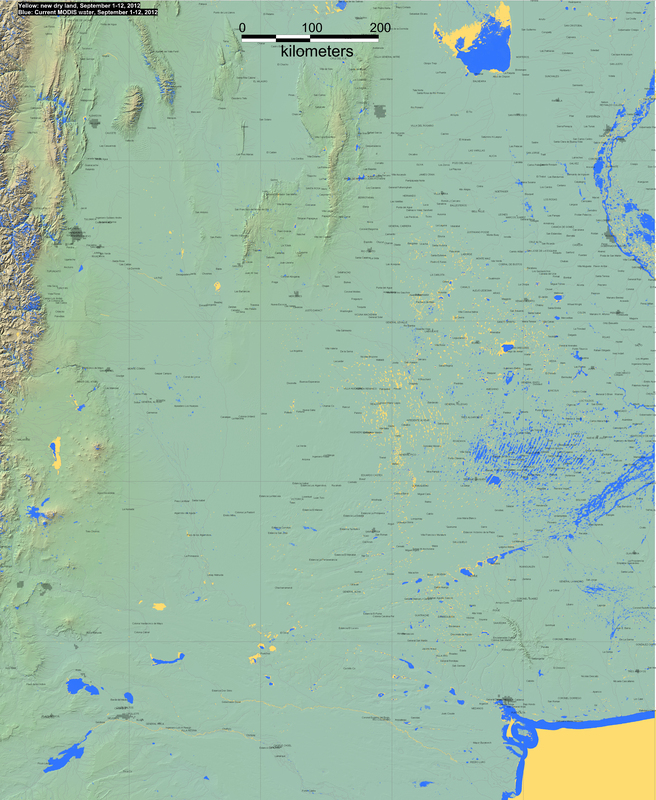 Yellow indicates newly dry land, that was covered by surface water on a reference date (February, 2000, from the Shuttle Radar Topography Mission Water Body dataset). As lakes, reservoirs, and rivers shrink, yellow areas appear and increase in size. Notes: 1) In mountainous regions, terrain shadows mimic surface water and are mis-classified as water in our current algorithm; we are working to reduce such noise. 2) The reference water is at much higher spatial resolution (90 m instead of 250 m). As a result, many small or narrow water bodies are shown in yellow, but are not necessarily locations of reduced surface water. Larger yellow areas, however, should have been classified as water during the current accumulation, and thus represent significant surface water contraction. The contraction of lakes and artificial impoundments (reservoirs) in particular is well documented. Other information: See also the FAQ. Any clickable black dots on these displays link to the River Watch satellite discharge measurement sites. The shaded relief background is from topography provided by NASA SRTM data. Recent GIS data (daily surface water information, as .shp file water boundaries) from the automated MODIS-LANCE NRT Flood processor are located (find appropriate 10 degree folder) at http://csdms.colorado.edu/pub/flood_observatory/MODISlance/ . GIS data (MapInfo format) of the long term record of surface water are also available: at this location. Finally, see the technical description, and, when available, a powerpoint slide file of this display, or a time series of successive dates.